There are two shepherds filling 10 liter water jugs at the Aria Spring. They are grizzled and leathery. They have heavy mustaches. At the knees their pants are worn thin. They are not in a hurry. Six empty jugs will take a while. I can hear their sheep complaining on the slope below, with bells jangling and clumsy feet disturbing loose rock. The shepherds, however, sit and chat, undisturbed by their flock and oblivious to the foreigner waiting in plain view. This is rural Greece, a slow-paced bastion of old world Europe. Relax. Wait your turn. Take it all in. It is late September on the island of Naxos, and the crowds of summer have all but disappeared. The ferries from Athens ply the five hour route through the Aegean less frequently, hotels are winding down for the season, and the country roads feel empty and wide open. However, the sun is shining, the ocean is blue and warm, and the villages are pleasantly devoid of frenzied tourists. It is the perfect time to be here. With free reign to wander, unencumbered, across this large Cycladic island, you quickly discover that most of the narrow, serpentine roads inevitably pull you toward the rough interior. To this mountain. Mt. 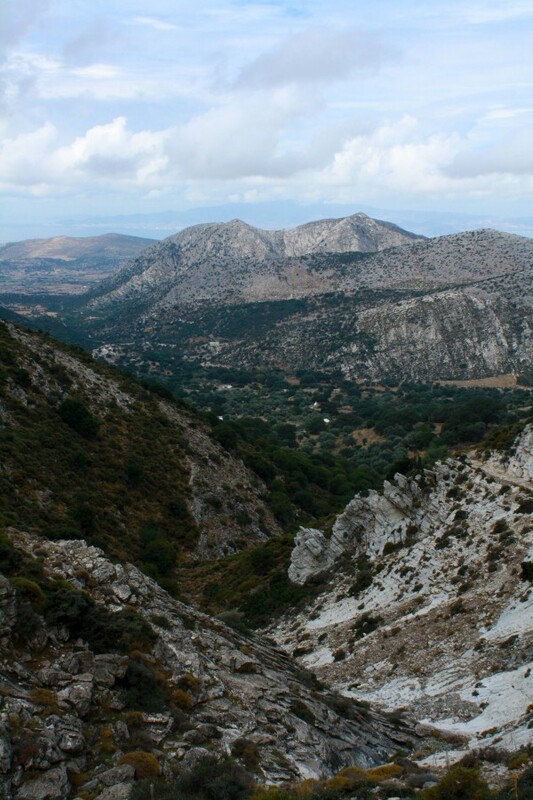 Zas, the mountain of Zeus. Rising 3,300 feet out of the glassy Aegean, with frowning cliffs and a summit shrouded in cloud. It is a spectacular sight indeed. But it’s status as the highest peak in the Cyclades is not what draws visitors to its scree-covered slopes, and it is not the reason that I am here on the mountain today, waiting patiently for the shepherds to finish. No, it’s not the mountain. It’s the cave. With such a lofty reputation, I am surprised to find, even in the off-season, only one other car pulled off, at the end of the road, where the trailhead is marked by a wooden sign. And here, at the ancient spring where the path begins, only these two shepherds, chatting in the sun. My friends and I seem to have the entire mountain to ourselves. After finally taking a long, cold drink from the spring, we head up the path, an easy path at first that quickly deteriorates as we go. Very soon, the smooth and orderly stones give way to rocks and thistle, marked by the occasional red dot, pointing hikers in the right direction. The gorge has opened up beneath us, sweeping down through scrubby hills and olive groves all the way to the sea, which appears motionless from this height. In the distance, Paros and Ios rise from the depths, Impressionist islands in the watery, blue haze. We are scrambling, hand and foot, over boulders and along ledges now. The cave remains hidden, nowhere in sight. It certainly seems a perfect place to hide a baby. According to the myth, Zeus was the son of the jealous titan, Cronus. In his paranoia that his children would usurp his throne, he swallowed every baby born to him by his wife Rhea. However, upon the birth of her last child, she tricked Cronus by giving him a stone, wrapped in swaddling cloth. The somewhat oblivious titan swallowed the stone instead of the baby, and Rhea sent the infant Zeus off to be hidden in this cave, where he was raised by nymphs and nursed by a goat. Eventually, the fears of Cronus came to fruition when his son, reared on potent goat milk, returned to the heavens, overthrew his father, and liberated his siblings from the discomfort of their father’s belly. 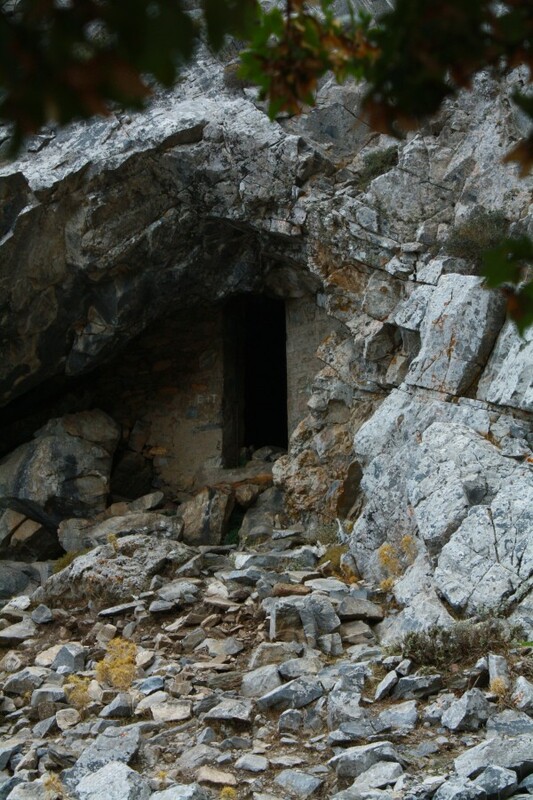 Given the importance of this origin story in Greek mythology, the cave to which we now ascend had become a key center of local devotion. For thousands of years, members of the cult of Zeus climbed this very path to perform rituals and orgies in the cavern above. Nearing our destination, we skirt a massive boulder forming a wall on our left, and zigzag up the final approach. 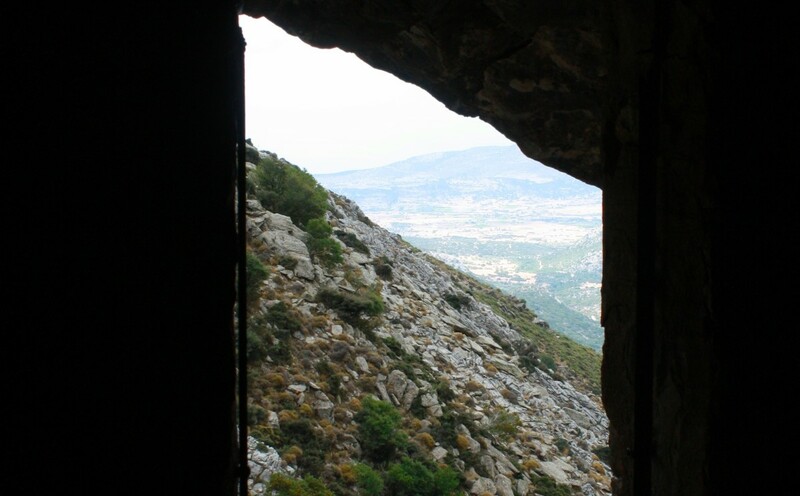 The opening to Zeus’ cave on Naxos. The entrance to the cave comes into view. The yawning mouth has been largely walled up with stone, leaving a simple low doorway as the only passage to the black within. Passing the threshold, there is an immediate drop in temperature as we are thrust into blindness. Poorly equipped for this expedition, each of us gropes for our cell phone, lights them up, and waits for our eyes to adjust. What is revealed is a large, low room whose dimensions increase exponentially as we move deeper into the mountain. An enormous chasm, stretching into oblivion. Slick black rock forms tables and shelves, stacking off in every direction. It is easy to envision the history of this place. Ancient man sheltering here from Neolithic storms. Fires burning. Worshipers turning and dancing, working themselves into a frenzy. Prostrating themselves on the wet stone floor. Soldiers hiding out during the Venetian invasions, giving little thought to the old stories of a god in a cradle. Explorers with lamps. Tourists with cameras. For eons this place had been trod by human feet. We pick our way, step by step, farther back into the void. To our left, an unnerving hole opens beside us, reminding us of how foolish it is to spelunk by the light of a cell phone. Eventually, the floor descends into a large open room which drips and echoes. Beyond it, the cave continues on, over a steep wall and back into the mountain. On and on, far beyond our reckoning. I turn and look behind us, back toward the door. The sun pouring through is now just a pinprick, drawing uncomfortably into the distance. No rope, no light, no water, no supplies. This excursion is over. As we retrace our steps, I try to imagine the mythic Greek version of history playing out in this space. A god-like baby, bundled up and lying on one of these cold shelves, surrounded by doting nymphs and suckling on a goat. He would eventually grow strong and powerful, springing off the gray summit towering directly above us, to take his place on Mount Olympus. He would rule the world and bask in its worship, a far cry from his humble beginnings. It’s an amazing story of great ambition, but right now, I’ll settle for a long drink from that spring at the trailhead, and some fresh baklava in the village below. Chris Watts is a frequent contributor to EthnoTraveler.